This chapter brings together numerical and implementational topics from the previous chapters in three application areas taken from fluid mechanics. First we present a solver for a general time-dependent and possibly nonlinear convection-diffusion equation, where the implementation constitutes a synthesis of most of the Diffpack tools mentioned in Chapters 3 and 4.2. The next application concerns waves in shallow water. 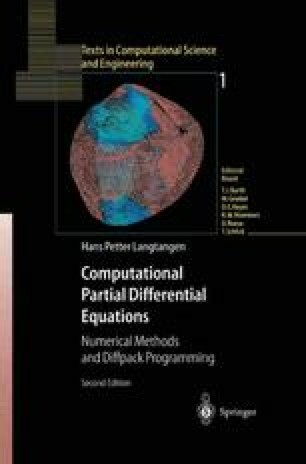 We first treat finite difference methods for the system of PDEs on staggered grids in space and time. Thereafter we describe suitable finite element methods for weakly nonlinear and dispersive shallow water waves. The rest of the chapter is devoted to incompressible viscous flow governed by the Navier-Stokes equations. A classical finite difference method on staggered grid in 3D extends the ideas of the finite difference-based numerical model for shallow water waves. A penalty method for the Navier-Stokes equations, in combination with finite element discretization, demonstrates how numerical and implementational tools from the Poisson2, NlHeat1, and Elasticity1 solvers in previous chapters can be combined to solve a time-dependent nonlinear vector PDE. Another finite element method for the Navier-Stokes equations, based on operator splitting, is also discussed, with special emphasis on efficient implementation.